Cut heavy scrapbook paper or card stock on a paper cutter into 5-inch by 7-inch pieces. Cut as many pieces as desired for this project. You can also cut extra pieces to keep ready in a craft box for future postcard crafts. Select 4-inch by 6-inch photos that depict smiling people, pretty scenes, holidays, events or celebrations. Print as many as needed for this project of the same picture, or use an assortment, depending on who the postcards will be sent to. Use the glue stick to apply glue to the back of each photo. Press each one onto the center of a 5- by 7-inch piece of card stock. Lay a piece of card stock on top of the photo and press, smoothing the photo onto the card to remove any air bubbles or bumps. Let dry. Proceed the same way with each postcard created. Use a pen to identify the photos on the postcard under the photo, providing information about the subject and when and where it was taken. 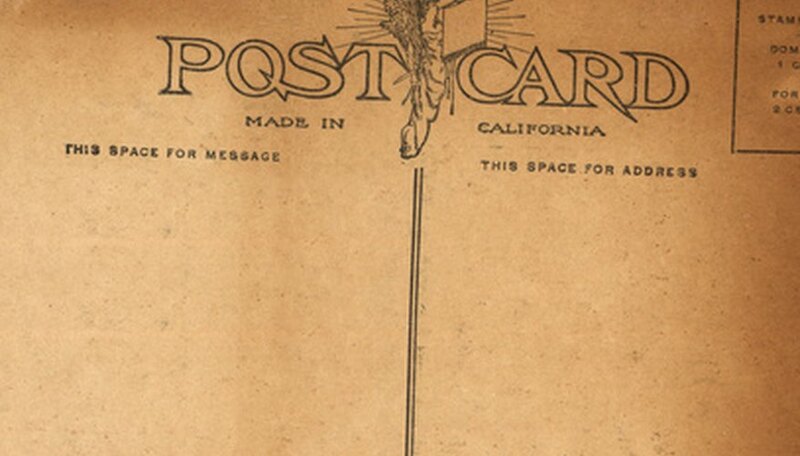 Stamp "Postcard" on the back of the postcard with the rubber stamp near the top left. This adds a bit of nostalgic embellishment to the postcard. Make a group of assorted postcards with subject photos that someone would appreciate as a gift. "Postcard" rubber stamps can be purchased at craft shops or on the Internet. They are available in different sizes and designs. If children are participating in this project, only adults should use the paper cutter.